From a distance, your prized cactus looks as if a group of passing school children had plastered it with freshly chewed white gum. Closer inspection reveals something different, and it's not mold. Depending on the type of cactus you have, the waxy white splotching is a cochineal scale or mealybug colony. To restore your plant's good looks and preserve its health, you'll need to act. A close-up of a cholla cactus. Pinhead-sized cochineal scales feast on prickly pear (Opuntia spp.) and cholla cactuses (Cylindropuntia spp.) both of which grow in U.S. Department of Agriculture plant hardiness zones 3b through 11, depending on variety. Flat, segmented mealybugs target orchid cacti (Epiphyllum spp. ), which grow as houseplants outside of USDA zones 10 through 11. Both insects hide beneath protective layers of soft, fibrous white wax. The bright-red female scales have pigmentation so strong that they're farmed as commercial dye sources in several warm-climate countries. Mealybugs are typically yellowish or gray. Both cochineal scales and mealybugs deprive the cactus of moisture and nutrients by draining sap with their hollow, tissue-piercing mouthparts. The biggest threat they pose comes from blocking the sun the plants need to manufacture food. An uncontrolled scale population eventually covers enough of the pads to interfere with photosynthesis by preventing sun from reaching the plants. If your cholla or prickly pear is withered and yellow, it's time for action. Mealybugs' sticky waste, or honeydew, attracts layers of sun-blocking sooty mold to orchid cacti. 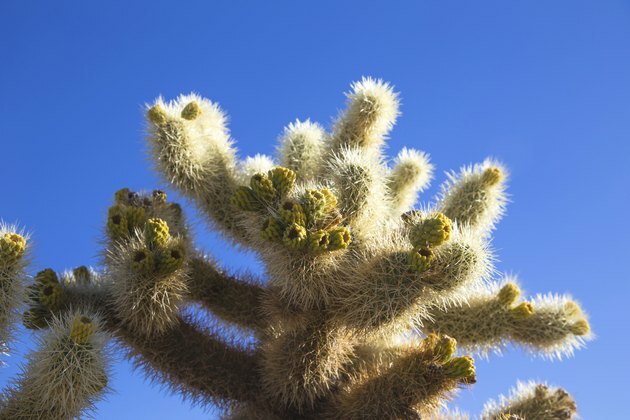 Chollas and prickly pears handle light cochineal infestations without much difficulty. To deal with a small number of the insects, put on heavy gloves and prune the infested pads off at the joints, disposing of them away from your garden. Avoid accidentally spreading disease accidentally by wiping your pruning tools off between cuts with a rag dipped in rubbing alcohol. To eradicate a large colony cochineal scale colony, blast your cactus with a garden hose. The water's force removes the insect's waxy coverings. Then spray them with a solution of 1/2 teaspoon of non-detergent, liquid dish soap mixed in 1 gallon of water. The soap suffocates the exposed scales without leaving residue toxic to honeybees or other beneficial bugs. Dress in yard clothes when spraying, in case you're splattered with runoff tinted red from smashed scales. You won't eliminate all the pests, so repeat the spraying as the colonies rebuild. Treating mealybugs on a spine-free orchid cactus is relatively simple. Use the hosing technique on an outdoor plant. After wrapping an indoor cactus's container in a plastic bag to prevent overwatering, set it in a sink or shower for spraying. Dabbing a small number of mealybugs with cotton swabs dipped in a solution of 1 part rubbing alcohol to 3 parts water also works. Always quarantine a new cactus before introducing it into your yard or home. Check it daily for a month and treat scale or mealybug infestations immediately. Check and treat an orchid cactus that spends the summer outside before bringing it in for the winter. If many people grow cactuses in your area, it may be almost impossible to prevent all infestations of cochineal scale.